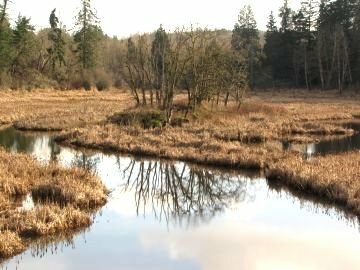 Chase River is 8 minutes south of downtown Nanaimo, and also close to the Nanaimo River - it's a great place for families and outdoor enthusiasts, or people who just want a beautiful property with quiet surroundings. While locals distinguish two neighbourhoods in this area - Cinnabar Valley (see below) and Chase River - the real estate board just uses the name "Chase River" for this whole region. See homes for sale below, or to read more about Chase River and Cinnabar Valley real estate, read down below. When European settlers cleared farms at what is now Chase River, it was a rural stop on the railway. There are still a few blocks around Fourteenth St with huge lots; several gorgeous old-growth fir farmhouses are here. There are some great shopping amenities here, including a RONA, Buckerfields, a huge supermarket, gas stations, lots of restaurants (fast food, Smitty's, pizza, quick sushi) a liquor/beer store, and more. Why's it called Chase River? In the very earliest days of Nanaimo and the Colony of Vancouver Island, Governor James Douglas sent a gunboat from Victoria to apprehend two murderers, one of which was hiding in a First Nations village on the Nanaimo River. The murderer fled through the snow and made his way up a small river. A party of soldiers and HBC guides gave chase, and found him in his hiding place because they heard the click of his flintlock rifle (which failed to fire because the snow had made the powder wet). The murderer was hanged at what is now Gallows Point on Protection Island. Two local places were named that day! Then in 1863 coal was discovered along the banks of the river, setting the stage for the "Chase River" mines to be established (near what is now Park Avenue Elementary School, as well as near Petroglyph Park and Chase River Estuary). A lot of Cinnabar Valley homes have great views, because there are high slopes on the east/west sides of the valley. The newest homes are west of Extension Road, up the sides of Extension Ridge and backing onto the beautiful Harewood Plains area. Along bus routes? There is one bus (#7) that comes down here from Nanaimo, about every 70 minutes (more during peak morning/afternoon hours). If you have any questions about Chase River or Cinnabar Valley real estate, please contact me!